What is the Localino RTLS? The Localino real-time localtion system (RTLS) is a versatile complete system solution that allows you to locate and track people and other moving objects with centimeter accuracy even indoors. The locations of users are determined and trajectories can be analyzed. Our developed technology allows to determine the position within a building even without an external GPS signal. The data acquisition takes place by means of the Localino hardware provided by us. For an exact position determination only our Localino Anchor and Tags are required. External cloud services or special routers are not needed! There are also no user fees. Localino indoor localization can be configured within a minimum amount of time. Once all anchors are placed two minutes of your time are enough to configure a small system setup. Do you have questions about our products or would like to setup an individual localization system? Please contact us! To use the Localino RTLS, you require at least three anchors. Each anchor is equipped with a localization- and radio interface to perform localization, communication between the anchors, tags and data transmission to the server application. The tags are mobile transceiver units. Due to their compact dimensions and various mounting options, the tags can be easily attached to moving objects such as industrial trucks, pallets and packages, shopping carts, shopping baskets or be worn from persons. Localino is a versatile and complete solution for indoor localization. During development we ensured that installation and maintenance are as easy as possible. Therefore, with Localino, cable connections as well as special routers or server devices are not necessary. In order to be able to perform an exact indoor localization, you only need three anchors and at least one tag to determine it's position in two-dimensional space. If you want a localization in a three-dimensional space, you need at least four anchors. The measured data is sent via the local WLAN to any IP address. Our system is highly scalable and can be easily extended to multiple rooms and larger areas using additional anchors and tags. If necessary, additional anchors and tags can be added even during operation. How does the Localino RTLS work? The anchors are used to determine the location of a tag and are installed at fixed positions inside the building. The tags are mobile and are attached to the objects to be located. Both Anchor and Tag are in permanent exchange and thus enable an exact indoor positioning measurement. With an integrated battery, the tags can be used independently of the mains supply. Due to our energy saving efforts, the integrated batteries can power the tags up to several months. The data measured by the Anchors are sent via the local WLAN to any server or PC and are evaluated there by our software. 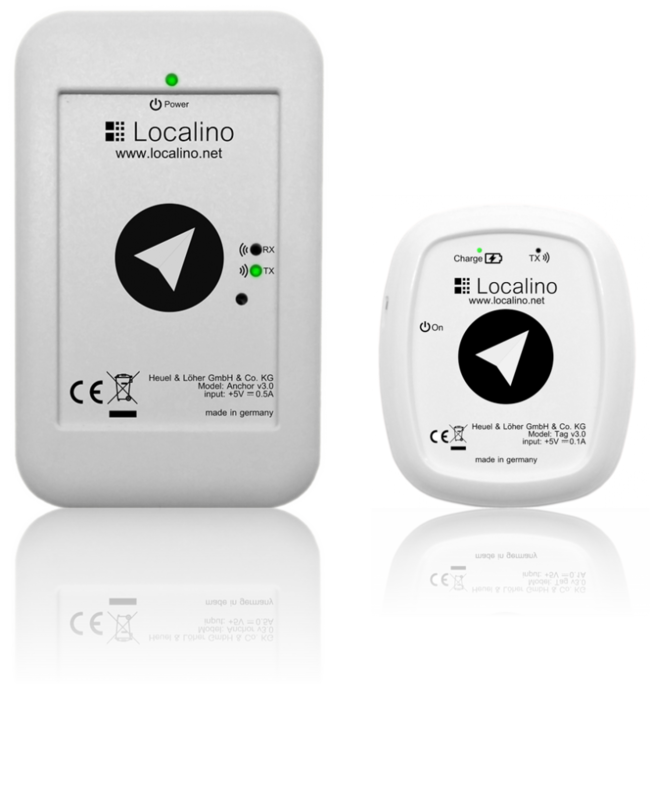 For which applications is the Localino RTLS suitable? Make market research effective with Localino! From customer tracking to the measurement of waiting times at the supermarket checkouts, Localino helps you to collect valuable customer motion data. Detect "blind spots" in your store and make sure all areas are seen by your customers. How do you measure resource efficiency? Is there optimization potential in production? Do you know the exact position of your operational and auxiliary materials within the warehouse? With Localino you can answer "yes" to these and other questions related to process optimization in the area of Industry 4.0. Do you know where your hall crane, the forklift or your special equipment are located exactly? The hardware we offer is well-prepared to answer these manufacturing challenges. How accuratly do you know the interaction of your players? How accurate are the proposed moves? Track individual players, analyze and optimize their interaction using Localino. Which advantages does Localino offer? Most indoor localization systems use Bluetooth, WLAN or RFID signals to locate a person or object. As these systems estimate the distance based on receive signal strength, the accuracy is within several meters only and an exact location determination can not be performed. However, with our technology, we are able to locate a person or moving object down to a few centimeters, using a time-delay based measurement method. This way, an accuracy of about 10 cm can be achieved. Using three Anchors a two-dimensional localization is possible. When using four anchors, a three-dimensional localization can be performed. The localization between Anchor and Tag uses UWB (Ultra-Wideband) signals. Unlike Bluetooth technology, which is used in beacons, UWB technology can achieve a significantly longer range. The actual realizable range depends on the signal propagation conditions, which are influenced, for example, by walls or objects that are located between the anchor and the tags. Depending on the environment and configuration, Localino can reach a range of 20 meters to 100 meters. Localino is expanding together with your company! Localino is a highly scalable localization system. After the installation you can integrate additional anchors and tags into the system without much additional effort - and without interrupting the operation. The anchors and tags operate in a self-organized network, which is why Localino does not require a master anchor or control server. This reduces the integration effort and planning enormously. Localino is characterized by its ease of use. With our step-by-step instructions and growing number of video tutorials, you can set up the indoor localization system in no time. Neither the system setup nor the usage does require any special previous knowledge. The tags are powered by an internal rechargeable battery. This ensures power-independent operation. Thanks to the optimized energy consumption, the integrated batteries have a long battery life and can be used for up to several months without recharging. However, recharging is done via a micro USB port (5V DC). The battery is a standard cell and can also be replaced by the user. The Anchor power is supplied via a micro USB connection with 5V DC. A standard USB power supply (500 mA), as it is used for charging smartphones, is recommended. Alternatively, the Anchor can also be powered independently of the mains, via a standard 5V USB Smartphone Power Pack. The anchors have very compact dimensions and can therefore be easily installed in the company, in retail and in the sports hall. Our tags have a slim design, low weight and easily be attached to objects or worn on the body using wrist straps, clips or neckbands. We have selected high quality housings for Anchors and Tags. The system components are protected against dust and very resistant to shocks. Therefore, the tags can be easily used on industrial trucks such as forklifts. A backend software processes the available data and provides the results in a data stream. The backend software operates on a standard PC or even a mini PC (such as a Rasperry Pi). The localizations can be displayed on almost any device connected to the network. A standard PC is sufficient. Localize and monitor your goods with a single infrastructure hardware! Localino positions our Localino Tags in 2D or 3D with high precision using ultra-wideband technology and simultaneously detects third party Bluetooth beacons / Tags that transmit iBeacon or Eddystone messages. Localize Localino Tags with high precision. At least three Localino Anchor detect and measure distances to the Tags using ultra-wideband signals. Then the Localino Backend calculates the position. Detect Bluetooth iBeacon / Eddystone. Localino Anchor have optional Bluetooth capabilities that allow to detect the presence of BLE iBeacon / Eddystone messages emitted by BLE tags. This operation runs simultaneously to the ultra-wideband localization. The Anchor decodes the received BLE message (MAC ID, Major, Minor, UID, calibrated RSSI) and forwards the information as a real-time datastream. This datastream includes the corresponding Anchor ID that has detected the iBeacon. This allows you to monitor presence of your BLE enabled devices and map the position in close proximity to the Localino Anchor with the same hardware that you use for precise positioning using ultra-wideband technology. It is possible to mix standard Localino Anchor and Localino Anchor with Bluetooth in a single setup. 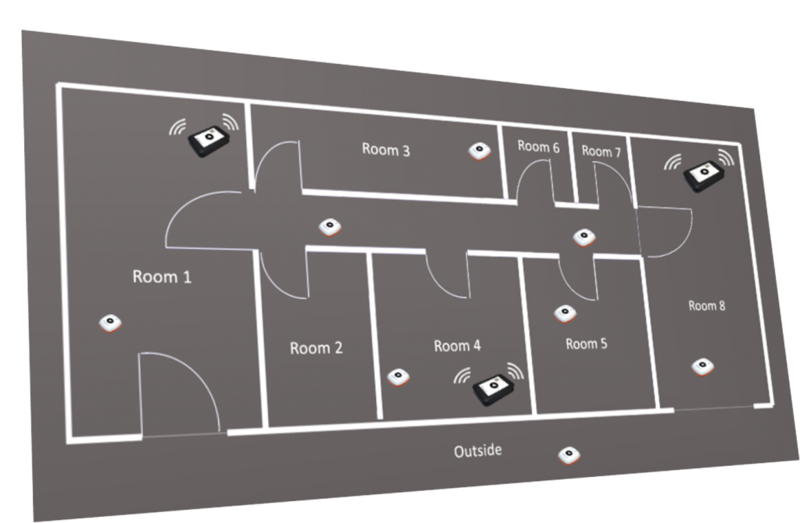 For example each room could have two normal Anchor and o a single BLE enabled Anchor to detect the presence of BLE devices as well. The BLE Anchor will also act as a normal Anchor to position Localino Tags with high precision.